Location-based services are often associated with the check-in, but people search for places through search engines and map applications too. Google is the most-often-used search engine, so it’s important that your business listing is easily searchable. Enter Google Places: a directory listing of your business that displays photos, reviews, and essential facts about your business (such as address, phone number, and hours), as well as real-time updates and offers a customer can take advantage of. A Google Places page connects several Google experiences to your business, two of them being Google and Google Maps. If you want to capture the on-the-go customer who’s searching with a smartphone, you need to claim your Google Places listing and take control of your Google presence. Organic searches: You can influence what people searching for your business find in search results, including your business name, contact information, hours, payment types, and the categories associated with your business. Map searches: You can influence what information people get when searching Google Maps, including your phone number, hours of operation, and website address. Google Places ratings: Customers can leave reviews and ratings. Users can get recommendations and rate restaurants based on their preferences. Be sure to check what people are saying about your business. Spend time responding to reviews. Thank people for praise and make an effort to understand why people are having problems. Actions like this generate goodwill, build advocacy, and encourage people who are already vocal to be more vocal about your business. 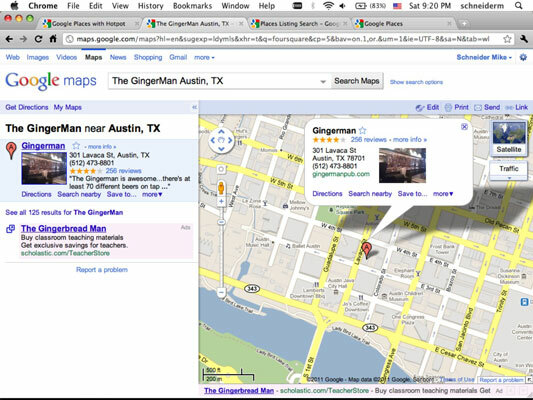 Search Google Maps and get a location-based result. Click the link on the left to go to the associated Google Places page. 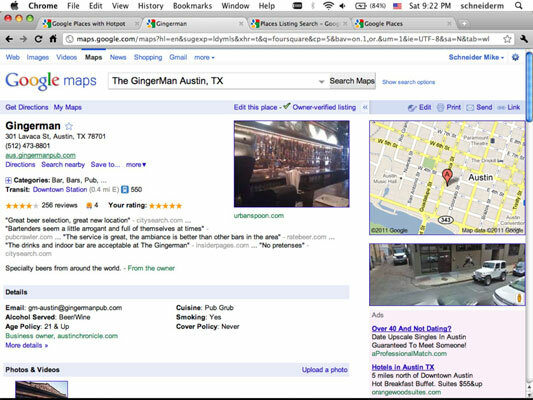 The Austin Ginger Man’s Google Places Page. Show which geographic area you do business in. If you’re a service-oriented business where you travel to serve customers, you can show which areas you serve. And if you run a business without a storefront or office location, you can make your address private. You can make your listing stand out on Google and Google Maps with tags. Tags are yellow markers that allow you to promote an important part of your business. Unlike the rest of the Google Places features, this one isn’t free. You can upload your own photos, and also request a free photo shoot of the interior of your business to supplement your existing photos. Offer customized QR codes to your customers. You can download a QR code (a bar code) unique to your business. You can place your QR codes on your business cards or other marketing materials, and customers can scan them with smartphones that take them to the mobile version of your Places Page. If your business gains enough popularity on Google Places (determined by Google via how many hits your Places Page gets) Google will send you a window decal to place in the window of your store. Your decal includes a QR code. If you’re promoting a sale, a special event, or anything else that you want customers to know right now, you can communicate that directly to your customers. You can also provide extra incentive by adding coupons (maybe your current LBS offer), including ones specially formatted for mobile phones. With Google Places, you also get a Google Analytics–style dashboard that shows how much activity you’re getting on your page.